Preheat oven at 150°C. Line a baking sheet with non-stick baking paper/ parchment. 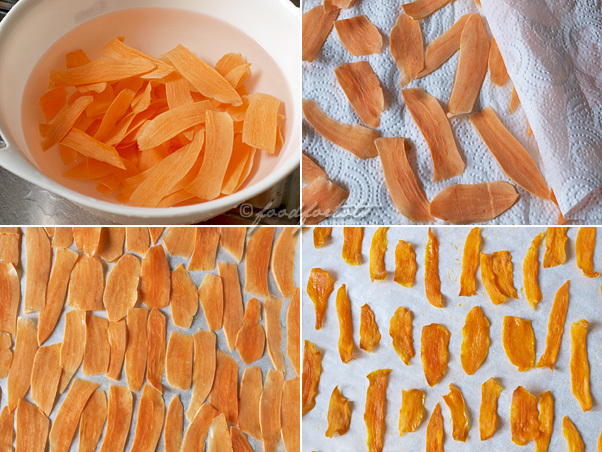 Use a swivel peeler (or mandoline slicer) to cut the sweet potatoes into strips or any preferred sizes. The strips must be thin and uniform in thickness so that they can turn brown and crisp within the same cooking time. You may also need to trim those pointy or ultra-thin edges if necessary. Wash and rinse them several times until the water is not cloudy. Then soak them in water for 15 minutes. This helps to get rid of the starch and make them crisp. Drain and pat them dry with kitchen papers. Make sure they are completely DRY so the oil can coat them easily. Put the strips in a bowl and toss with oil and salt (if used). Spread the strips out in a single layer (without overlapping) on the baking sheet. Bake for 15 minutes. Then rotate the baking sheet and continue to bake for a further 8-10 minutes and check every minute as the strips can go brown very quickly. Remove from the oven if the strips start to curl and brown at the edges. Once the strips are completely cool down, they will be even crispier. Best to serve them immediately. Though you can store them in an airtight container, they will soften a bit after a while. The baking temperature and time should only be used as a guide. They will vary depending on the type of oven you use, and thickness and shapes of the crisps. You can double the amount and bake them by using two baking sheets at the same time. But, you may need to adjust the baking time if necessary and swap the baking sheets around after 15 minutes. For best result, I would suggest you to bake only one sheet at a time. So easy I want to try making them! I really need to up my intake of sweet potatoes. Thanks for the pics – very helpful. Lovely! I like sweet potato chips too. These are beautiful! They look as delicious as the Terra brand I like buying. Brilliant! I can’t wait to try them. They look super thin, light and crispy! I love healthy snacks like this. Haha my kids would eat the same way (from bottom!). =) Sweet potatoes are my favorite potatoes and we eat many desserts and snacks made of sweet potatoes too. I love this snack! Can I use normal peanut/vegetable oil to substitute olive oil? 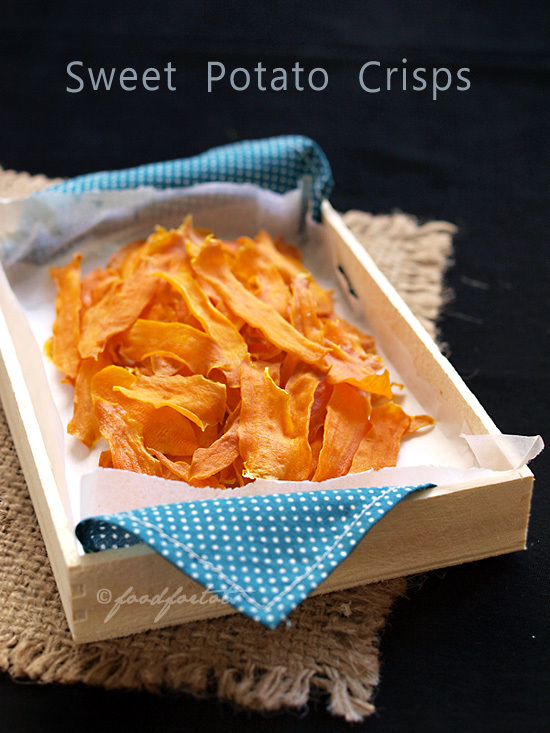 Sweet potato chips are a definite favorite here! These sound delicious! your boy eating the crisp is sooo cute!! i’ll have to keep trying. in the meantime, even the non-crispy sweet potatoes are still delicious! o i miss eating those as an afternoon snack…so delicious! Can’t wait to make this! looks so delicious! Tried these today. They are delicious but an awful lot of work for the amount you get at the end. I but a small amount of brown sugar through half the batch before cooking for the sweet tooth at our house and they worked out well too although they do brown up quicker. Hi! It finally turned crispy! Yes, you were right about the mandolin slicer. 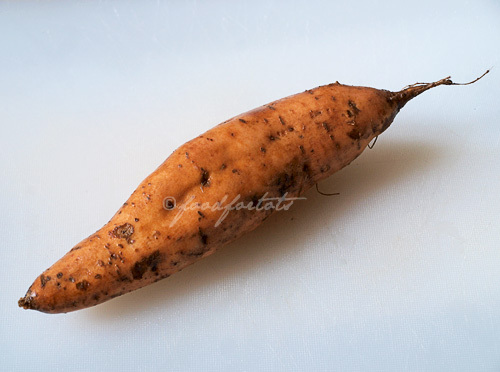 While the sweet potatoes were in uniformed thickness, it was too thick to turn crispy. The peeler worked perfectly! Thanks again!! Thanks food-4tots for the recipe! This is my favorite snack nowadays 🙂 It’s yummy and so easy to make 😀 thank u! I just stumbled on this recipe through another website titled “101 Amazing Sweet Potato Recipes”. I LOVE sweet potatoes and my tot does too. I use them to make him “fries” and only use a little oil and cinnamon. I don’t even know why I haven’t thought of this. I’m always looking for a non processed healthy “on the go” treat for him. I will give it a try this weekend. I’m pretty excited about it. Hopefully I can find some more ideas through your website as well. Thanks!! I don’t have an oven as yet. Can pan fry? 34 queries in 0.254 seconds.